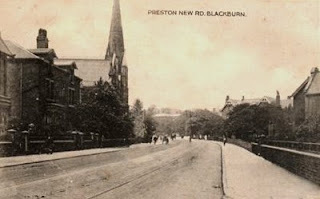 Two images showing the lower part(s) of Preston New Rd. 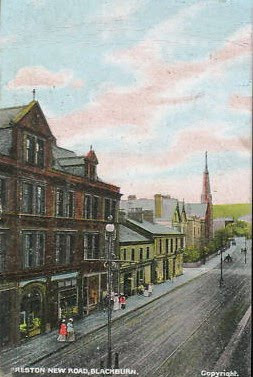 The coloured postcard shows the Aspden Buildings to the left. They are still standing today, but the smaller properties next door, have been replaced by the new Capita Building and of course, Barbara Castle Way now cuts across the road, where the junction of Alma Street can be seen in this old image. Just further on, can be seen the steeple of St Georges Church, which stood on the corner of the next street, New Park Street. The second postcard, shows the same church and the properties to the left of it a little more clearly and in the distance, can be seen the swerve of the road, where the entrance to the park is, on the right hand side. I wish the Aspden buildings were still there - they were lovely, but I think they've all gone (part of the terrace that connected to them still remains). The main section shown in that postcard with the three large dorma window sections is definitely gone. On the first link (with the buildings still standing pre-Barbara Castle Way extension), you can see all that remains now is on the extreme left of the photo(directly in line (vertically) with the red traffic light). On this second link you can see these same windows that were at the extreme left of the first photo now form the end of the building line where the new gable end has been placed. The Capita building straddles the land where the Aspden buildings were and the smaller properties, and Barbara Castle Way cuts through the right hand section of the smaller properties. There's quite a big space between the old gable end and the new capita building, and this is where the left hand side of the Aspden Building would have stood. Yeah. I can see it now. I stand corrected. So the Aspden Buildings were the building that had a large function room upstairs, which I think was also used for a martial arts school (White Cloud was it? ).